Edit: All vouchers out, sorry! 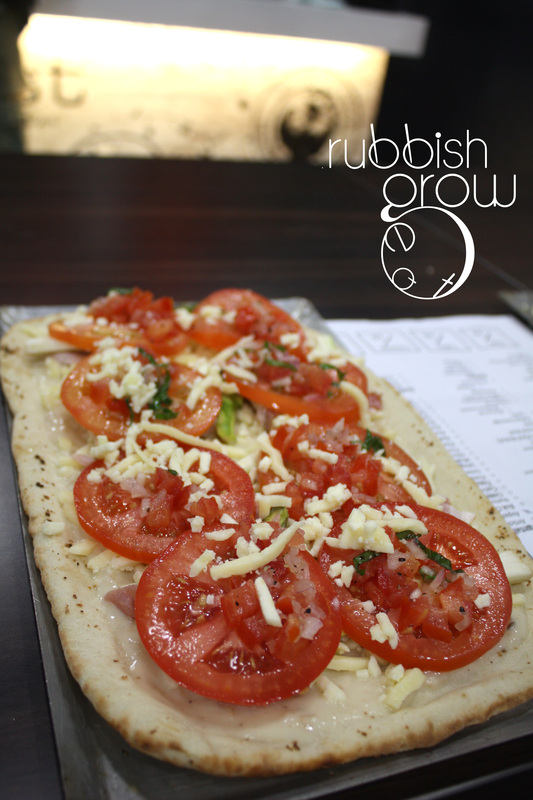 The first four persons who share the link through our Facebook (showing “via Rubbish Eat Rubbish Grow”) will get $20 worth of Crust voucher each. Good luck! May the fastest finger-clicker and highest internet speed connection win! This was the most fun media tasting we had attended. 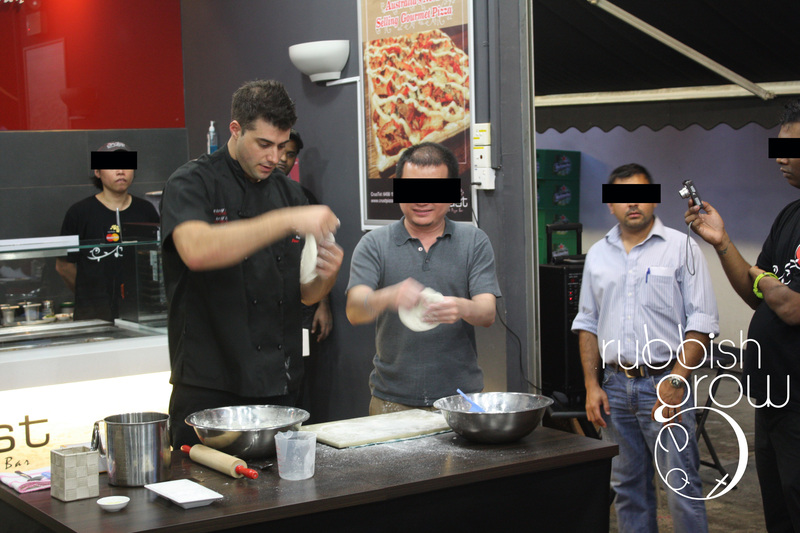 We had hands-on session of inventing our own pizzas – but first, we review the restaurant before talking about the event. While Chef Peter Augoustis (see his handsome face in the photo below) was studying to be an aviation engineer, he was making pizza as a part-time job. 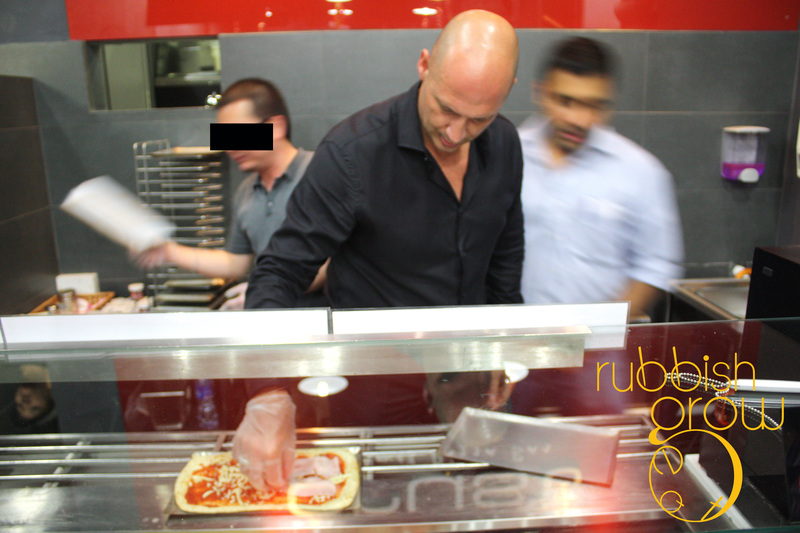 In 2001, in Australia, his cousin asked him to help in a pizza joint. 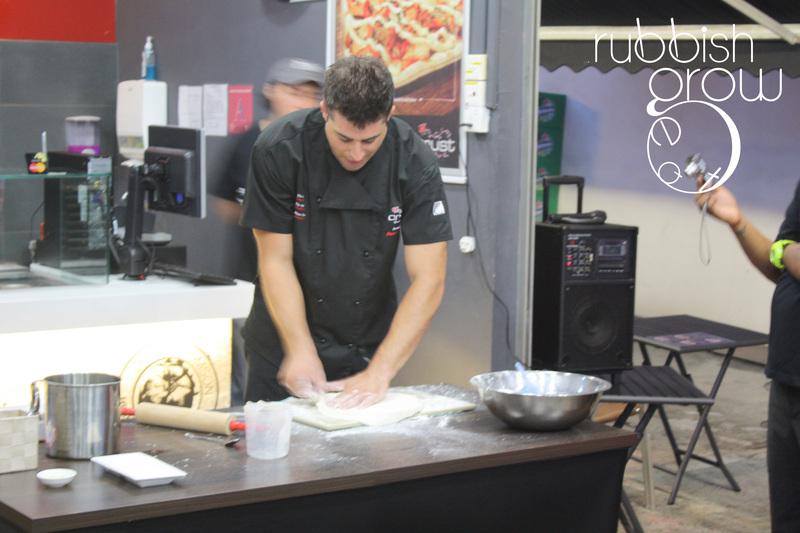 In 2007, Chef Augoustis entered a nationwide pizza competition and came in tops! The competition organization sponsored him to Vegas for the World’s Best Pizza – he won and then spent the winnings at Vegas! Hey, it’s only world’s best pizza right? No big deal. Don’t need to rush down here. 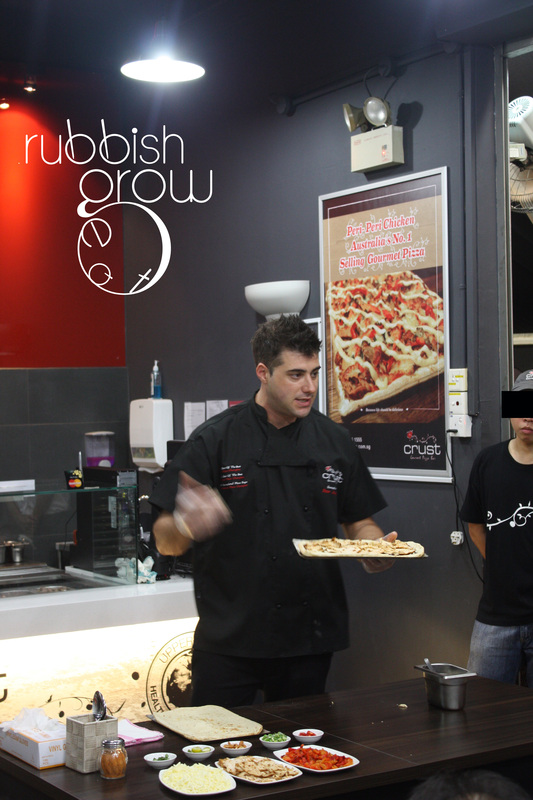 In ten years or so, Crust Pizza has 100 over outlets in Australia and two in Singapore, Holland Village and Upper Thomson. The success is insane! 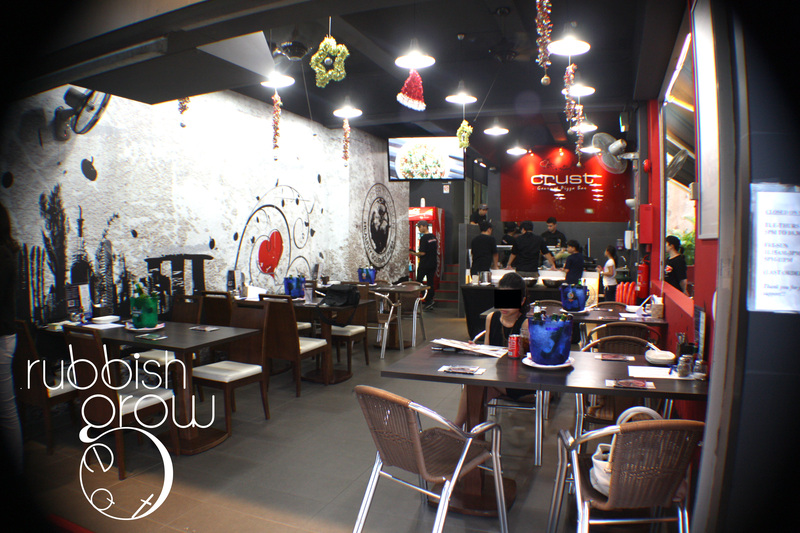 The decor of the place is – well – fuss-free, neighborhood eatery lor. The open concept makes it friendly but I wish there were aircon. 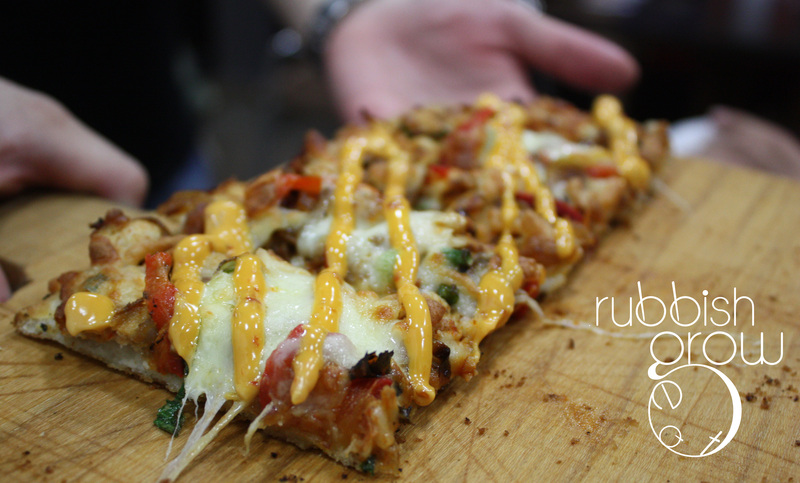 Some pizzerias claim to be fusion food by, say, just adding jalapenos and calling it Mexican pizza. 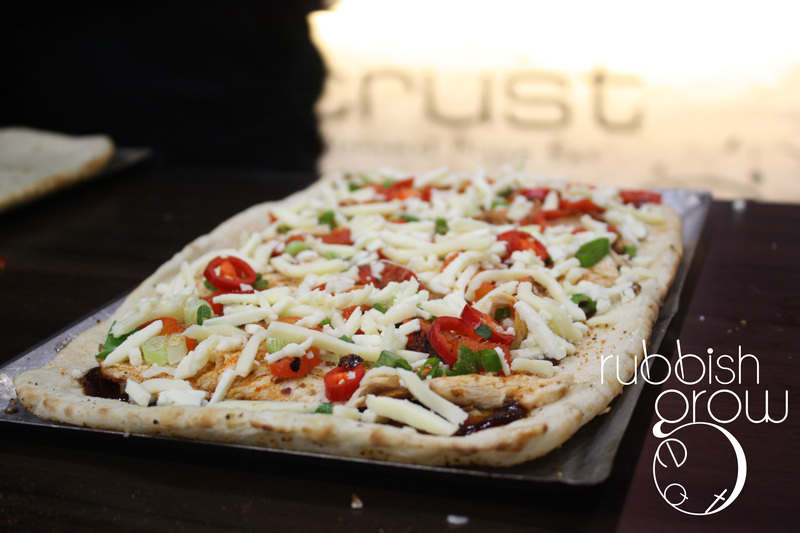 But the idea behind of Crust Pizza is that it truly reinvents the notion of a pizza; it cooperates the food from a certain culture. For instance, the Roast Duck Pizza ($22, duck breast, bak choy, sesame seed on hoisin base) and Five Spice Pork Belly ($23, pear slices, wild rocket, crushed walnuts & balsamic glaze) are invented in Singapore and brought back to Australia. The bad thing about having an event and a food tasting at the same time is we couldn’t take proper notes, so we are not commenting much about the food. 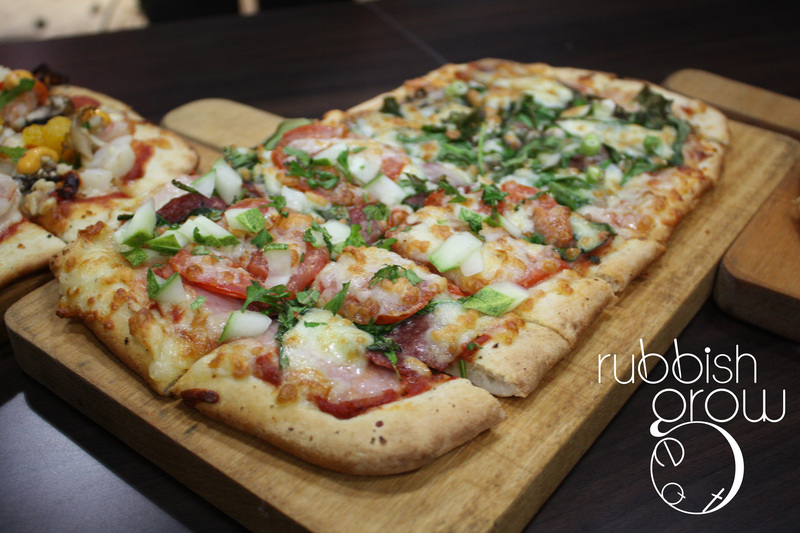 There are four types of pizzas: meat ($23, including pork, lamb & beef), poultry ($22), seafood ($25) and vegetarian ($21). Mr NGFL and Wise Guy tried one from each category. There are a few vegetarian options. 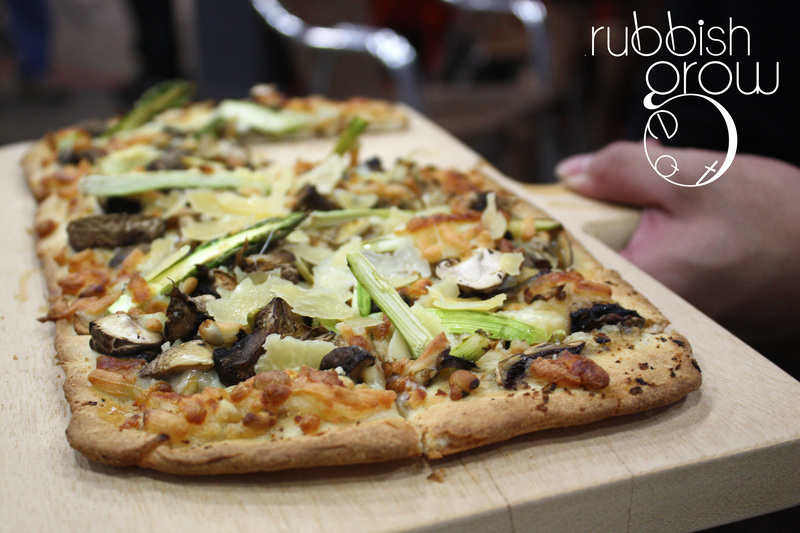 The wild mushroom pizza has a distinctive, powerful taste of wild mushrooms. You really can taste the wildness or wilderness in the mushroom. 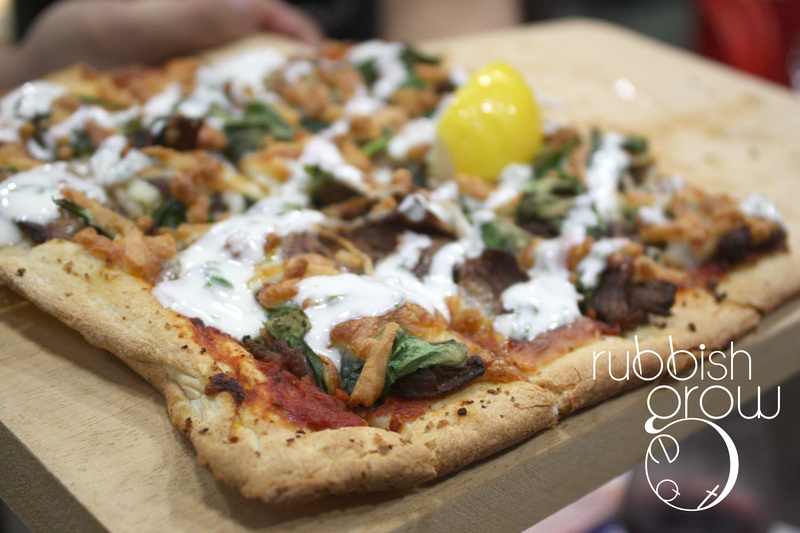 This is the pizza that won the Best Pizza in the World. It was very delicious, and certainly reminded Mr NGFL and Wise Guy of lamb kebab, very Arabian. The flavors worked very well together and there wasn’t the stench of lamb. 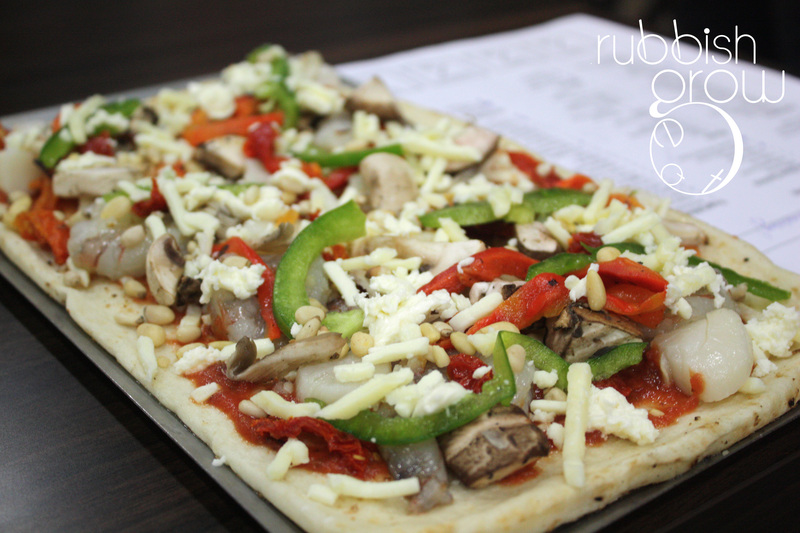 We can’t say in all honesty that it is the best pizza we have ever tasted but it was very excellent. This is a must order if you’re a kebab fan. 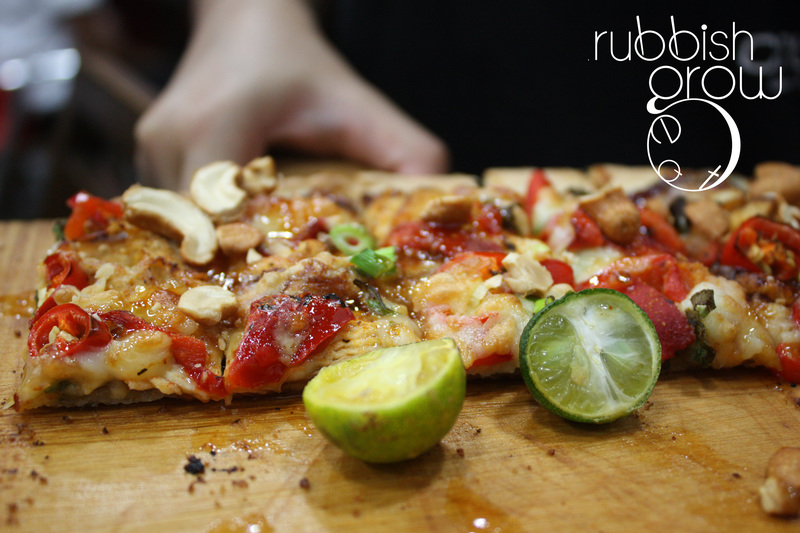 This was not memorable for us probably because pizzas (as dough) tend to dilute the taste and you need a strong seafood (like salmon) to make the pizza stand out. 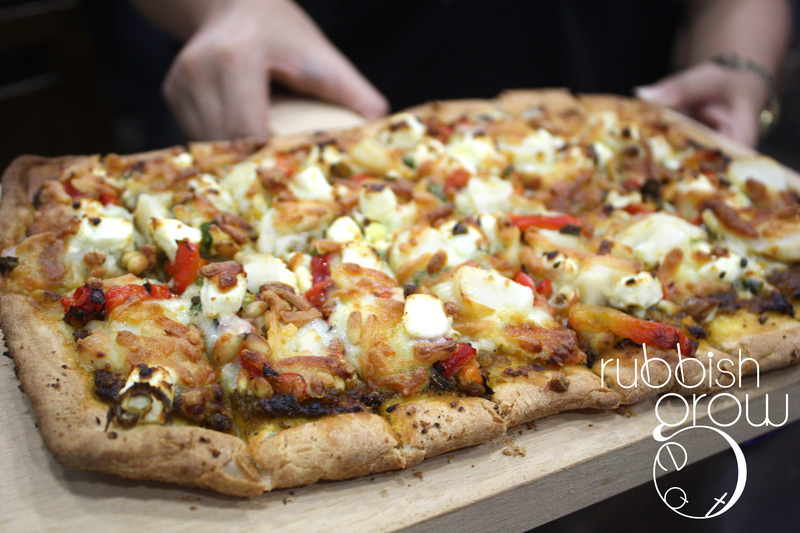 Peri-Peri Chicken ($22, Marinated chicken breast, spring onions, roasted red peppers, caramelised onions & bocconcini (Italian white cheese) with Peri-peri sauce.) – Now Joanne Peh doesn’t need to stomp out of Nando’s. She can do it at Crust Pizza. This is another favorite of ours. It was moist and the flavors came on strongly, sweet and spicy with a creaminess. If you have a second pizza, order this. Spicy-hot, decent and easy on the eyes. My one minor gripe is it markets itself as kungpow chicken. It’s hoisin-sauce with fresh red chili and cashews but it’s not dried-chili, sweet-sauce, stir-fried amalgam. It’s good by itself but it just isn’t kungpow-derful. One of the important criteria for judging a pizza is the crust. Here, the crust is dusted with semolina, a coarse flour-like wheat substance, giving it that oomph and texture. The chef also revealed to us a secret: poke the crust with a fork: this enables the air to go through, fluffing it up, and giving it an airiness. Overall, all the 5 pizzas ranged from good to excellent. Delivery to Thomson and Holland Village area. was AWESOME. First, Chef Augoustis demonstrated some secret techniques, teaching us how to judge a good pizza, and what ingredients should go on top, and which ones are bottoms. Then we were split into groups and had to invent our own! It made us appreciate how difficult it was to come up with original recipes. Chef Augoustis needed some kungfu help from Mr NGFL. Naturally. 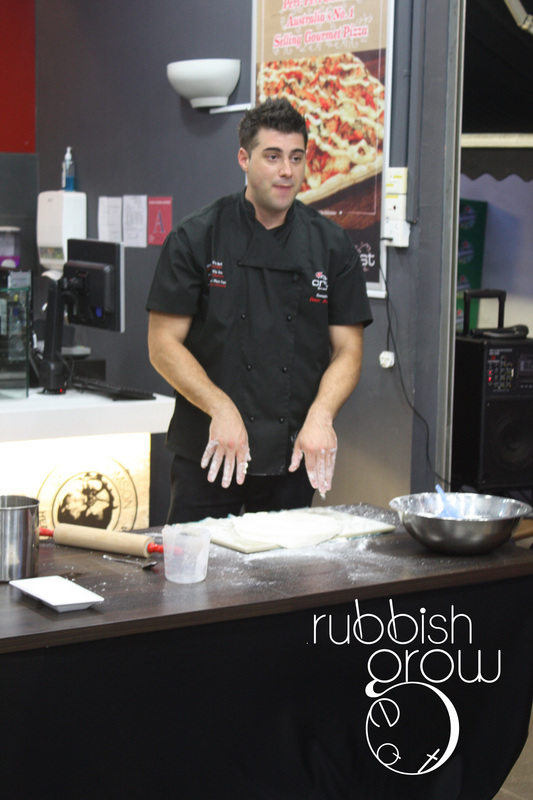 Chef’s killer pizza was done – emphasized by his karate chop! Eeeyarrr! 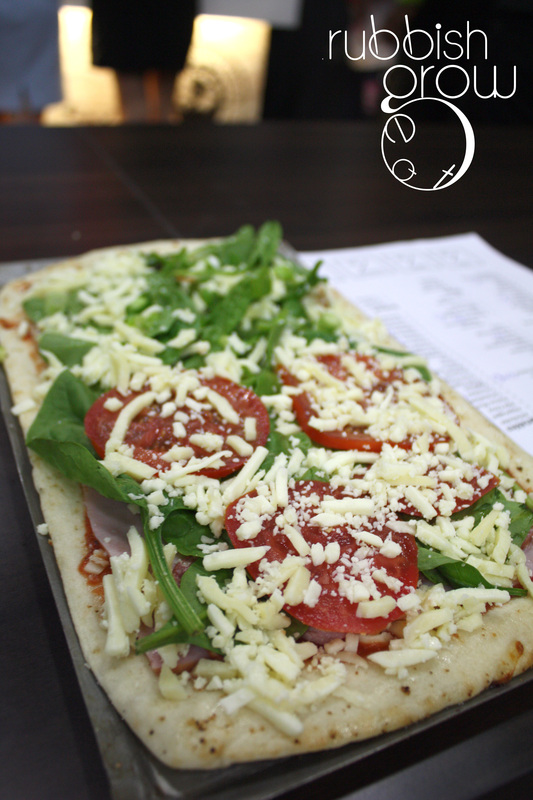 The Chef’s uncooked pizza – How does it compare with ours (see below)? Team 1 named their pizza after its group member. 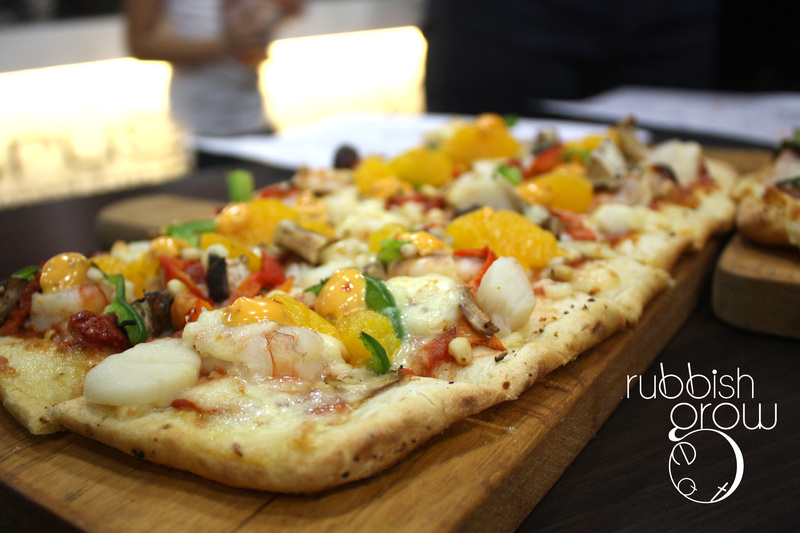 It’s a seafood pizza with mandarin orange. Considering Timon is in his teens, I say this pizza is rather well-done. This group came in 3rd. 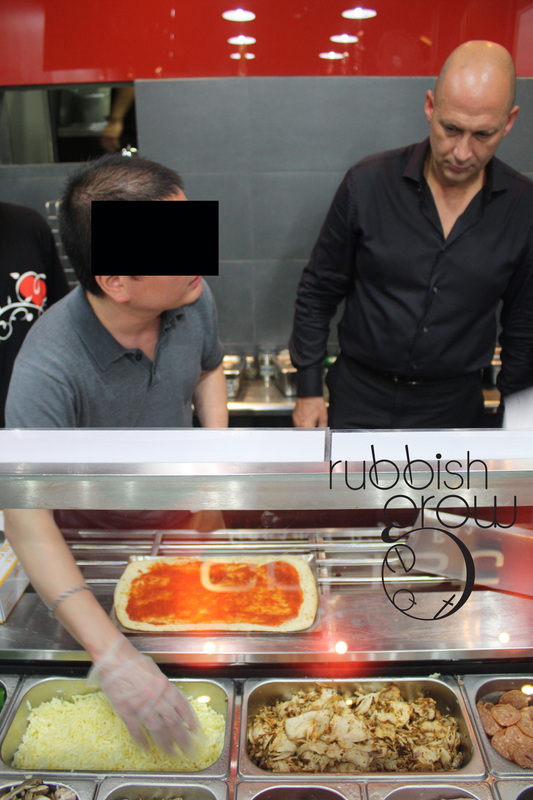 This is Rubbish Eat Rubbish Grow + The Finder from SPH! 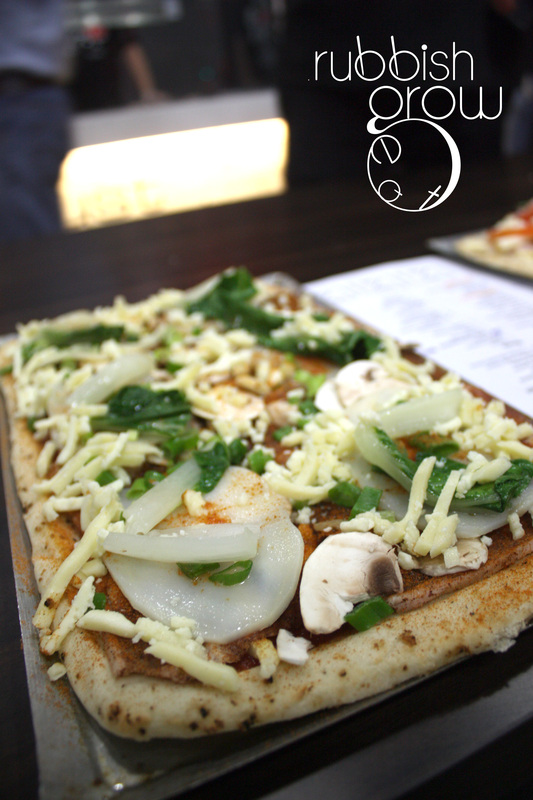 Our idea is to have a East Meets West Pizza. Half has Western ingredients, while the other half, Eastern ingredients. We used a unifying base sauce so that the two different tastes would go well together and there isn’t any “border.” It’s a globalized pizza. 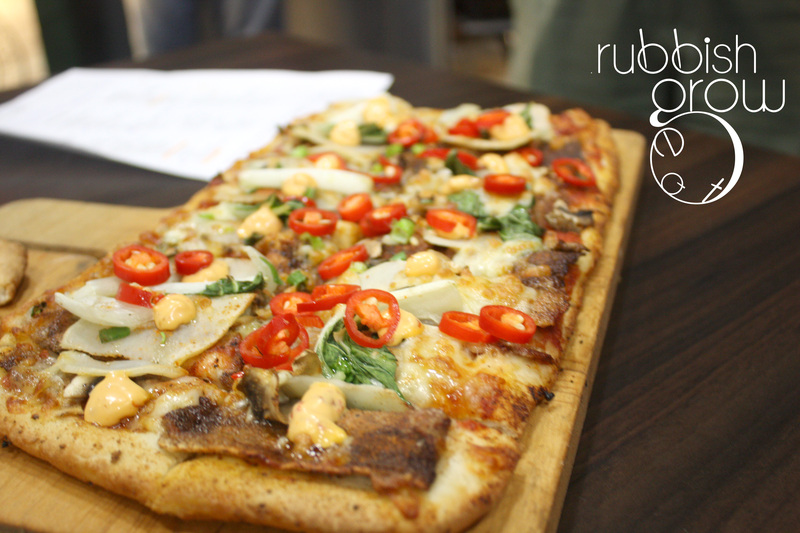 Our pizza shared the highest points in taste with the winning team, but we lost out on our branding, so we came in 2nd. This is a team of gorgeous ladies. I was surprised this team came in last because the idea was excellent, to make a breakfast pizza. And it did taste very breakfast-y too. Ok, maybe the tagline can be improved a bit… but still, it was a good idea and executed well. Tagline: Their tagline is the best but I forgot. I rated them the highest score, giving them 8/10 for across 4 categories of judging. But on hindsight, I should have given them low scores so that our group could win!!! This group consisted of 3 food blogs, 2 of whom I am friendly with [Melissa Koh & CY from Hungry Epicurean; I don’t know the last one]. Funny story, CY is 14K’s colleague, small world (14K is a contributor of this site). Anyway, their pizza was fiery and came on strongly; our pizza had a more layered taste. Two different styles and we shared the same points. In any case, their marketing was strong with clear aim (devil=spicy). Great tagline, so great I forgot. Ok, no, seriously, it was good, I rated their tagline 8/10. I’m just being bitter; malspinsters (male spinsters) are bitter people. I need to get laid soon. So overall, they deserve to win. RERG would like to thank Alex and Crust for hosting us. team 3 pizza looks nice, with eggs and tomatoes! Very tasty and breakfast-y too. I like. 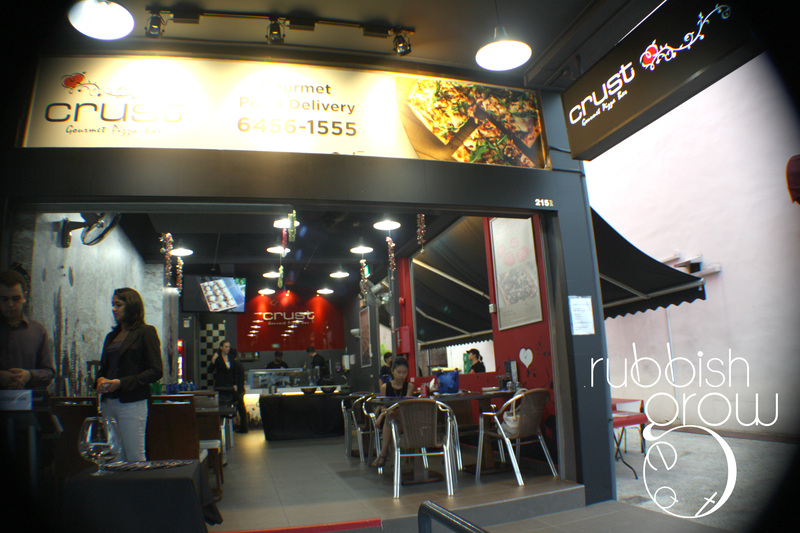 actually, after I tasted other groups’ pizzas, I thought, die lah, sure lose already. The other teams’ pizzas all tasted so good. So I was very, very surprised that our group came in 2nd.